The hot plate contemporary photography conversation continues to be Instagram - so much so that despite the fact the basic phone I own from my local service provider offers me not much more than Sudoku and a calculator much less a camera, I would like to contribute to the conversation. The issues that have been raised around Instagram touch on fundamental questions of the medium and some of Instagram’s major impacts on photography have not been discussed in the articles I’ve read. Instagram’s greatest value is in helping to increase collective visual literacy through its filters, the pages on its website explaining the qualities of these filters, and – more importantly - through encouraging people to take and share photographs by making it fast and easy. This increase in knowledge of photographic terms and properties augments our ability to communicate through image-making and for the photographic language to be used to a fuller effect with a broader audience. This benefits all professional photographers as well as the population at large. In short: the practice of making and sharing images while learning about photographic vocabulary increases visual literacy and the “reading” of photographs made beyond Instagram. How fantastic to suddenly have friends who are not professional photographers asking me about tilt-shifts and bokeh. While Instagram is primarily argued about in terms of being a set of filters for mobile phone photos, it’s worth noting that images not taken with an iPhone or Android can be added to the user’s Instagram account and filters are an optional addition. Instagram is also a photographic community. 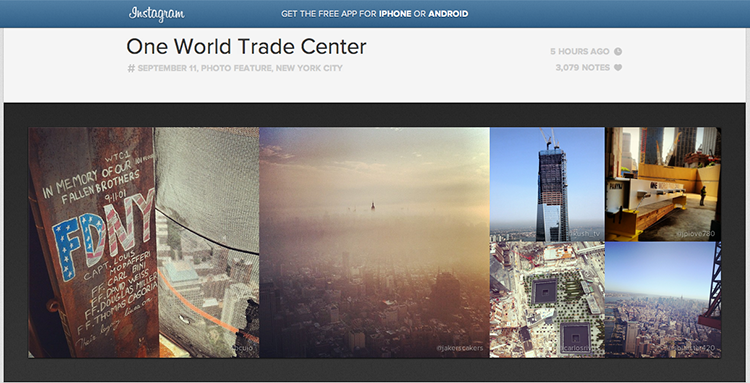 With likes, follows, and comments, Instagram has created a host structure along the lines of Flickr. This is great in terms of community-building around images and photography and an important element in judging Instagram’s impact, even if it’s not necessarily an innovation. For the professional photographer, Instagram is being seized upon as a social media marketing tool. They are tapping into Instagram's exploding user database to expand their audience by creating a faster, more immediate relationship with them. Photographers are also using the service as a visual diary and to provide "teaser" images about new projects. Photographer and New York Times Lens Blog editor James Estrin is quoted in the British Journal of Photography as saying, "In photography, the key is to build an audience of people who have some relationship with what you're doing – either with you personally or via the issues you're covering. These are people who may, one day, buy your book, or support you on Kickstarter or Emphas.is. The question is: What does Instagram mean to a photographer? I think it means strengthening the relationship between you and your potential audience – the people most inclined to spend money on you." Moving beyond its value in popular photography, what about the hot button question within the hot plate topic: Instagram as photojournalism? I think it’s fairly clear filtered Instagram images cross journalistic codes of post-production and should not be considered as a journalistic tool. But what about unfiltered Instagram images? Joerg Colberg argued in a recent post that they should not be used in photojournalism through an argument based in context – that if the same camera and aesthetic are being used to photograph someone’s breakfast as well as the after effects of war in Libya, that it essentially trivializes the latter. I would argue it’s a valid photojournalism format and I don’t have the same contextual concerns. Additionally, the implied extension of Colberg's argument – that photojournalism should be made with cameras the average person doesn’t own and most can’t afford so that they will feel the gravitas of the subject matter – is problematic. In fact, to take the conversation beyond unfiltered Instagram for a moment to expand it to mobile phone photography more generally, the elimination of the equipment barrier between amateur and professional brings multiple benefits. The movement towards citizen journalism, for example, has had the advantage of providing images and stories that move beyond what the limited number of professional photojournalists can cover and the images citizen journalists provide merit consideration as part of a valid news collection and distribution process. I'm not sure Colberg's argument leaves space for that. Additionally, legitimizing popular cameras for news collection changes the dynamics of class and regional bias in news coverage by allowing photographers from developing countries, for example, to be able to work as a photojournalist at a cost that isn’t several years worth of salary. Few professional photographers in the States and Europe can keep up with gear; in the rest of the world, the issue is compounded. Equipment leveling means bias reduction and broader voices in contemporary photojournalism by reducing participatory costs. Going back to Colberg, there is a corollary argument to his that I do agree with. Subject matter, in my conception of photography, should dictate the equipment used. In graduate school I started a short-lived project photographing different types of temporary city shrines (ghost bikes, murder site memorials, highway crash markers) with a 35mm camera. My professor, Abe Morell, gave me a scolding, saying that this subject matter deserved the respect of a large-format camera. I understand that argument now. I would reconstruct Colberg’s argument to say that it’s the gravitas of the subject matter and the respect it requires in terms of image quality and format that makes Instagram a questionable fit for Libyan war photography, not the fact that people use the same popular camera to photograph breakfast and their kids. This is a subtle but, for me, crucial shift in the argument. I’m not saying you need expensive equipment to make good images, I’m saying certain subjects call for higher quality formats when possible. Portraits of amputee war victims, for example, may very well fall into that category. It’s clear mobile phone photography - especially as their optics improve - will be a major factor in the future of photojournalism due to the phone's size and unobtrusiveness, as well as for how it facilitates free, realtime images that are outside of editorial control. In some cases these qualities trump the argument of "subject matter dictating format," simply because the phone camera allows images to be made that couldn’t be safely or easily made otherwise or because the speed of distribution warrants the choice. So if I’m arguing for the benefits of the same equipment being used by amateurs and professionals, is Instagram the dawn of photographic democracy? Should photojournalists fear their place? Not really. Great images are being made by photographers using Instagram, professional and amateur alike. However, consistently being able to make great images and great visual stories are going to remain the standard bars for photographers, and the consistently strong work and well-done stories I've seen with Instagram have been made by already established photographers such as Matt Eich and Ed Kashi, both very solid photographers before making Instagram images. No manner of filters and post-capture manipulation can hide a lack of photographic training and experience. I view the casual Instagram user and their relationship with a professional more like the Polaroid as used by my mother when I was a child and Andy Warhol. The visual intelligence and thoughts about why and how to make images and the imagination used to combine and sequence images into a coherent visual project are being considered on radically different levels. An editor worth their salt understands the value of, but also sees the limitations of, Instagram and mobile phone photography by amateur photographers in news and documentary photography. As for art photography, Instagram follows in a line of experimental cameras and tools that expand the range of expressive choices artists have to work with, perhaps along the lines of the Polaroid (again), Lomography cameras, and the Holga. Projects are being made to explore its potentialities and some people will do amazing art work with Instagram. When projects move beyond simply exploring its properties and begin to use those properties to speak on a theme in such a way that we see and talk about the project’s content before the fact the images were made with an iPhone, we’ll be getting somewhere in terms of using Instagram to expand the expressive artistic capacities of photography. One of the major shifts with Instagram hasn’t been discussed in the articles I’ve read. Building on trends in use in mobile phone photography more generally and evolutions in how we have come to use digital images made with dSLR's and digital point-and-shoots, Instagram (as well as Hipstomatic) is conceptualizing photography as completely beyond the print; it's creating a digital, hermetic photographic process from capture to presentation and conceived of as a print-less photographic process. Doubtlessly photographers will create physical gallery shows with Instagram prints (and probably already are) and photojournalists are using Instagram for print publication, but the product is created, advertised, and used as a sealed digital system. This is a step beyond digital photography as thought of previously. Most digital photography exists as a digital archive and is shared online, but digital photography with dSLR's and digital point-and-shoots was conceptualized with the idea that the print would be a potential outcome of the photographic process – at least the best few images - as witnessed by the Kodak Picture Kiosk at your corner photography store and all the low-end home digital printers. Instagram has packaged, marketed and popularized mobile phone photography with no pretense of including the print as part of its process; it’s a file-sharing based product, building on evolutions in digital photography use and the inception of mobile phone cameras to end the run of the print in photography as an assumed final photographic product. This is nothing less than a fundamental change in the definition of the photograph. This digital-file-as-photograph structure of Instagram has advantages, from environmental impact reduction to consumer-friendliness. One potential issue, however, is if this structure is allowed to reinforce a trend in photography of replacing the physical object (print or book) with a digital format without understanding what is given up by doing so. While watching an online video of a photographic roundtable conversation recently, I was surprised to hear a photographer assume in her conversation that viewing the images on her site was the same as looking through her book for those that can't get a copy. It seems clear that it's not. The screen is a reduction of artistic choices and decisions. With the print you are allowed a broad range of vehicles for expression such as size and paper quality; through framing and mounting choices you create a physical body in space that has impact on the meaning and experience of an image; the choice of venue, installation, and use of lighting in space have repercussions for artistic intent. The photo book allows control of sequencing, as well as the qualities of scale, weight, and binding. The screen levels everything – the backlighting, the restricted viewing space, the lack of spatial and physical imposition on the body while viewing a photograph creates a deeply homogenous viewing experience. You lose control of viewing size and of choice of viewing environment. If Instagram reinforces the acceptance of the idea of the photograph as a digital product without photographers at least acknowledging and consciously accepting what they are giving up in that process, then Instagram's biggest impact - launching its product with the definition of the photograph as digital file - is actually also it's only risk. John Anderson, The Spark of Accident, Democracy or Monopoly Capitalism?